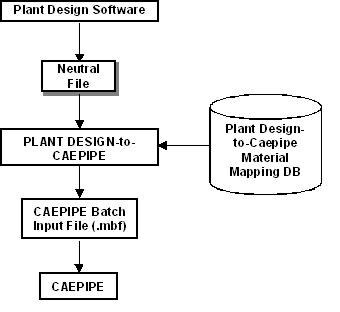 CATIA2CAEPIPE™, the Plant Design-to-CAEPIPE Interface, is a stand-alone program for transferring pipe geometry including section properties from Dassault’s CATIA software to SST’s Pipe Stress Analysis software CAEPIPE, by extracting information from the Piping Module (PIP 2). Tubing module is not yet supported. PD2CAEPIPE Interface converts the 3D piping model from the PCF file generated by CATIA. A PCF file can be extracted after setting up the configuration as given in this file. The execution sequence is as follows.